Want a well-mannered pooch? Teach these things first! If you were asked to define what it means to have a trained dog what would you say? If we asked that question to 10 different people, I'm willing to bet we'd get 10 different responses. There may be some similarities between the responses, but over the years I've found that people have very different interpretations of what a "trained dog" is. For some people the definition of a trained dog is simply one who doesn't potty in the house. For others it is a dog that has a gentle demeanor and knows a trick or two. For a few it is a dog that can run a 200 yard blind retrieve and bring back the bird unscathed. I've heard many people answer the question by saying a trained dog is one that is "well behaved." But since well behaved is as subjective as trained, I'd like to create some clarification around what "well behaved" should entail. Let's start by considering the daily routine of our companion dogs. That should help us come up with a list of skills a dog should have in order to behave acceptably in that environment. The average pet dog lives in the house with us, needs to get routine exercise, has visitors in the home from time to time and needs go to a few places like the vet or the groomer on occasion. With that in mind, here is what I believe is the minimum training a dog should have in order to conduct themselves politely in those situations. First off, the dog should have good house manners. This means he will not toilet in the house under normal circumstances. Any dog can get sick and have an accident, but a dog that is housebroken can stay at home alone, having liberty to be free in the house and will not potty for a duration of 8 or so hours. It also means that during that time alone, he doesn't chew up or destroy household items. A dog with good house manners knows what toys are his to chew on and leaves other things like pillows, the television remote and shoes alone. For the record, if you are starting with a puppy, expect it to take 12-24 months before you can really feel confident your dog is ready for that level of responsibility of being alone. Use a crate until you are certain! A well-trained dog comes when called. This should be considered an absolute must for all dogs. A dog that comes when called is a dog that gets to enjoy a great deal more freedom to run. If the dog can come when called, we don't have to worry about the dog slipping out the door, nor do we have to worry about any slight distraction that pops up when we take the leash off. Having the freedom to run reduces frustration and a dog with reduced frustration is a dog that is much calmer to live with. A well-behaved dog does not jump up on people without an invitation. They understand that keeping four paws on the floor is a must, even through the excitement of meeting new people. A dog that keeps four on the floor does not knock down the kids, startle grandma or muddy up our dress clothes. A dog should understand how to walk nicely on leash. Dogs need not have a perfect competitive heel command, but it only takes a bit of practice to teach the dog not to drag us or forge constantly when on leash. 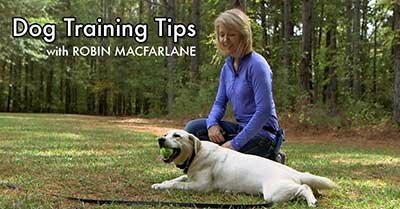 This simple skill allows anyone who needs to care for our dog the ability to safely and easily take them out to potty or walk them for exercise. A trained dog is one that can Stay in one place when told. This can be accomplished with a Down command or a Place command but the understanding is that the dog will remain in that spot until given permission to move. This allows you to have company over without the dog always being underfoot, or to take the dog with you to events and not disturb others. A dog that understands the concept of staying is a dog that is welcome most anywhere. A dog should learn to stop barking when told. It is unreasonable to expect Fido to never bark. The instinct to announce when someone violates a dog's turf is pretty natural. In fact, it is often desirable. Most of us appreciate if the dog is barking at someone we feel uncomfortable with. If our dog wards off an intruder with his barking, we praise him and declare the dog a hero! But we get very upset when the barking becomes a nuisance and we have no control of it. Since our dogs don't know who is and is not of ill intent, it is our job to teach the dog to simply stop the barking when told. The barking is never a problem, as long as we can control it and stop it as needed. Those are the essentials: house manners, come when called, no jumping, walk on a leash, stay, and stop barking. Any dog can learn those basics and that is a recipe for a good dog! Pull-Quote= Want a well mannered pooch? Teach these things first!